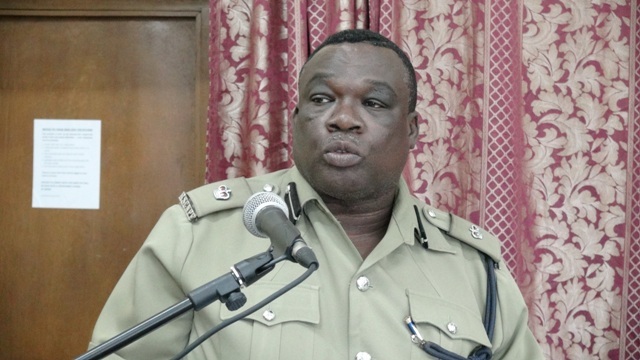 NIA CHARLESTOWN NEVIS (January 06, 2016) — Head of the Nevis Division of the Royal St. Christopher and Nevis Police Force Superintendent Hilroy Brandy says as the primary law enforcement agency in the Federation, the Police, is obligated to keep the community safe through collective effort, commitment and dedication to duty. He said if they are to keep the public safe, police officers have to be more visible, accountable and accessible in what they are called to do. According to Brandy, the division will be targeting a number of critical areas—robberies, gun related offences, break-ins, drugs, gang related violence, domestic violence, sexual and traffic offences—to reduce the incidence of crime in 2016. He also spoke to a necessary partnership between the community and law enforcement in the fight against crime. “Policing with the community is how we do it. Policing with the community is about creating real participation between the police and community. “A valuable partnership where policing not only reflects and responds to the needs of the community but where the community also plays an active role in delivering viable solutions,” he said. The Senior Police Officer stated that the division is committed to achieving all that it has set out in its challenging policing plan but added that the police would not be successful without the assistance of the community. In his view, safer streets will depend on a strong community of active citizens. Mr. Brandy appealed to partner agencies, prosecutors, courts, probation officers and jurors to work together to achieve the targets laid out in the Strategic Policing Plan. Also present at the service were Rev. Telford Matthew who delivered the sermon and featured speaker Evered Herbert while Insp. Conrad Bertie served as the chairperson.